And now let's take a closer look to the major US stock indices and some of their features that are important for trading. The main US stock indexes are the DJIA index, the S&P 500 broad market index and the Nasdaq high-tech sector index. DJIA index (Dow Jones Industrial Average). It was created at the end of the 19th century by its author Charles Dow - the index was published in 1896 and from this year there is a schedule for this index, thus it is the oldest index in the world with the largest history of quotes. Firstly index included 30 largest industrial companies of the United States, but then the largest companies from other economic sectors were added. As a result, the composition of the index has changed over time. This index has a feature of calculation, which distinguishes it from the other two main indices. The DJIA index is weighted by the prices of the stocks included in it, while many other indices, including S&P 500, are weighted by the companies' market capitalization. Therefore, the movement of the most expensive stocks has the greater impact on the index than less cheap ones. In the case of weighting by capitalization, the company's “total value” on the market is also taken into account, and it, besides the stock price, also depends on their quantity on the market in free float (Free Float). index of blue chips, the largest US companies, and in order to enter it companies need to have some capitalization indicators. So this index differs from the more “wider” S&P 500 index, which includes the 500 largest companies. For example, Boeing shares are the most expensive in the DJIA, their share now exceeds 8%. Over the past year, stocks rose by 90%, which gave about 7% of the annual growth of the index (which was 25% over the year). Therefore, the movement of the most expensive stocks have a greater impact on the index than less cheap ones. Thus, the Boeing’s weight is three times higher than of Wal-Mart, although, according to market capitalization the aircraft manufacturer is about $ 100 billion less than the retailer. Therefore, the same percentage change in two stocks, in the case of Boeing, will cause three times greater change in the index. Because of this feature, the movements of the DJIA index can be sharper and stronger than the movements of other indices. S&P 500 wide market index was created much later than the DJIA and it is published only since 1957. The index includes a wider range of companies, which are taken from the list of 500 largest enterprises by capitalization. Due to this, the movements of the S&P 500 index occur more smoothly than the DJIA index. Companies are divided into indices into 10 (according to other information, 11) major market sectors. Read more here. The S&P 500 index is almost completely identical to the DJIA index - this is observed even on shorter timeframes, like 5 minutes and a minute. Only the stroke can be different, but the movements of the indices correlate with each other by 95% -99%, unlike Nasdaq ones. It is most likely caused by the fact that the DJIA index includes companies from all sectors that are also included in the broad market index. These biggest companies also occupy a very large share in the S&P 500 index. Last edited by Gulfstream; 10-08-2018 at 09:48 AM. 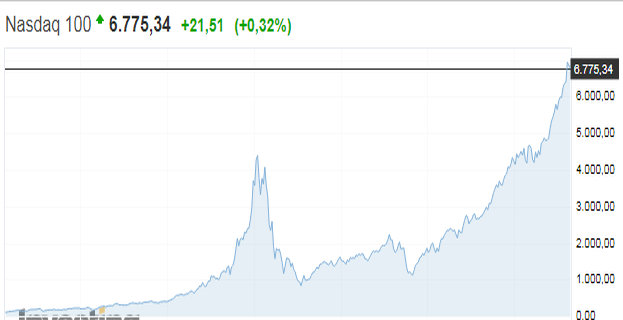 The Nasdaq index of high-tech companies includes high-tech stocks (electronics, software, etc.) and all modern industries, such as biotechnology, etc. These companies are traded on a special electronic exchange Nasdaq. At the moment, more than 5 thousand companies, including two Russian, are traded on this exchange. There are several Nasdaq indexes, two of which are main: Nasdaq Composite and Nasdaq-100. These indices began to be calculated even later than the broad market index - only in 1971. Nasdaq Composite is a composite index, which includes more than five thousand companies that are listed on the stock exchange. It is kind of broad index in this sphere. There is also narrower blue-chip index - the Nasdaq-100, the index of the largest high-tech companies in terms of capitalization. Features of movement. Nasdaq is moving very specifically and this differs it from the other two major indices. Often there are even opposite movements on small timeframes. Of course, a noticeable correlation is present, but still it is not as high as between DJIA and S&P 500. This difference in movements is explained by the fact that Nasdaq is an index of only one of ten industries, although this industry is very noticeable and influential in the economy and two other indices. Lets review briefly European stock indexes. The two main countries in the Eurozone (euro-currency zone) are Germany and France. And accordingly there are two most important stock indexes in continental Europe - the German DAX30 (or simply DAX) and the French CAC40. Even from the indices names it is clear that belong to "blue chips" category of Germany and France. DAX, in my opinion, is the most important stock index in Europe. It has a very explosive temperament, which is not characterised to calm german population. Anyone who has traded this index knows how he can jump for a couple of minutes and a third of a percent, or even half of it. This is due to the fact that although the index is weighted by capitalization (like the S&P 500), there are 7-8 very large companies that occupy more than half of the entire index. And when these companies move sharply, the whole index also reacts very strongly. The first six companies of the DAX index occupies half of the entire index. CAC40 in this regard is much quietly moving in percentage terms, it is usually noticeably less than DAX - for the latter 2% per day is usual level. And 3-4% of the move per day also happen sometimes. In this regard, DAX surpasses all indices, even the US ones, which go one and half-two times less per day. The peculiarity of European indices is a significant break between the closure of index futures (23:00 Moscow time) and their subsequent opening (at 9:00 Moscow time, Frankfurt opening). During these 10 hours in the Asian session, there can be a lot of things in the markets, that is why opening almost always happens with a gap. At 10:00 opens London and the stock session in the leading European markets begins. Bidding is held until 18:30 and until 23:00 o'clock only in the form of futures. Opening at 10 AM is characterized by strong movements that can go until the "dinner", which lasts from 13:00 to 14:00 hours, where activity usually falls. Since the opening of the US market (not the stock session) at 3 PM, there can often be a reversal or suspension of the previous daily trend. The British stock index FTSE 100 (Financial Times Stock Exchange Index, in Russian is pronounced like “Footsie 100”) states a little bit apart from all other indices in Europe, like an islander. Also, like the British pound, it often moves quite differently than euro - it also happens with the FTSE 100. The index includes the 100 largest capitalized UK companies, covering 80% of the total capitalization of all listed companies of London Stock Exchange. It is calculated since 1984. The index includes a lot of exporting companies, so their shares are very sensitive to British currency growth , which reduces (after conversion foreign currency into pounds) their profits and leads to decrease in shares - and hence the entire index. Also, there are a lot of raw materials and mining companies in the index, from which the index can react on fluctuations in raw material assets. All this, taken together, makes trading with such an index a rather difficult task. Where to trade with stock indexes? In order to do this, open a Pro-Standard account. Contract specifications can be found here, CFD tab. The names of the indices there can be different, for example, the S&P 500 is the US500Cash, but you can easy understand it. There is an opportunity to practice in trading on a demo account in the weekly competition "Week with CFD"
Indexes do not have fractional lots and only 1 lot can be opened. The smallest pledge (for 1 lot) has the S&P 500 index - only 26 dollars. And they can trade even with a small deposit. Also, the Nasdaq has not very large bail, about 70 dollars. The rest of the indices have a slightly larger margin: FTSE 100 about 100 dollars, DAX ~ 160 dollars, and DJIA ~ 240 dollars. Who can trade with stock indices? I would recommend trading with these tools first of all to those who are not good at trading on Forex for the underwritten reasons. And it is quite probable that one of such reasons may be the lateral, flat character of movements in the foreign exchange market, when consolidation in certain ranges is observed most of the time. Because of this, it is difficult to determine the direction of trading, even if it also changes many times during the day - in order to confuse not too sophisticated traders. Unlike forex, indices show more trendy movements. That means, you just need to determine the direction of entry, but not the worst for this point. However, it is noticed that many forex traders, especially beginners, generally ignore adjacent markets, preferring to look only at currency pairs. Then they wonder why things are going completely different from what technical analysis tells them. And the reason is that all markets are interconnected. Therefore, stock indexes need to be monitored as an indicator of risk appetite - even if you do not trade them at all. But still, it's worth a try. What is relationship stock exchange with points? what means by leverage? What is high leverage and low leverage? How can can recover an invested amount if some one loose in trading? What type of trading accounts are suitable for be-gainers?